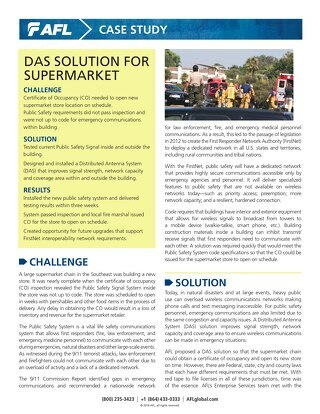 AFL provides customers of Comm-Works with installation, repair and maintenance support involving cable and wireless AP, security cameras, retail sales tracking and peripheral device installation activities. 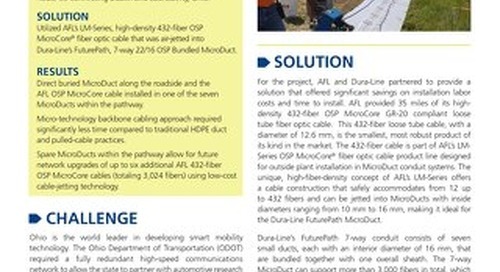 Forsythe Data Center used air-jetted fiber infrastructure system innovated by Dura-Line and AFL to achieve its mission of reinventing the typical data center colocation business and technology models. 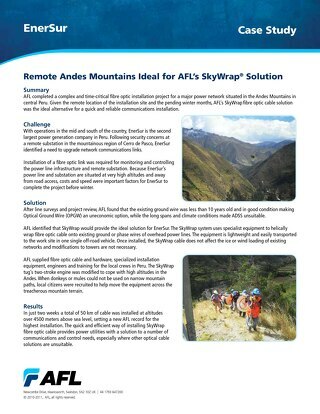 Given the remote location of the Andes Mountains and the pending winter months, AFL’s SkyWrap fibre optic cable solution was the ideal alternative for a quick and reliable communications installation. 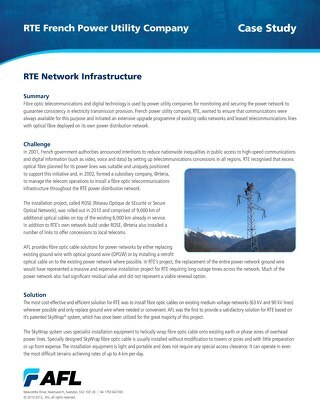 Fibre optic telecommunications and digital technology is used by power utility companies for monitoring and securing the power network to guarantee consistency in electricity transmission provision. 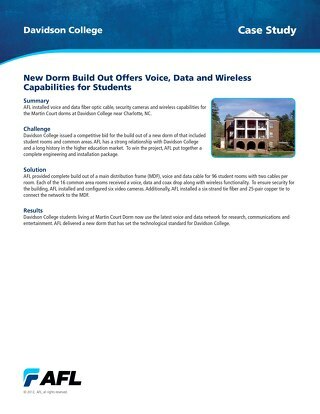 With the latest voice and data network for research, communications and entertainment, AFL delivered a new technological standard for dorms at Davidson College. 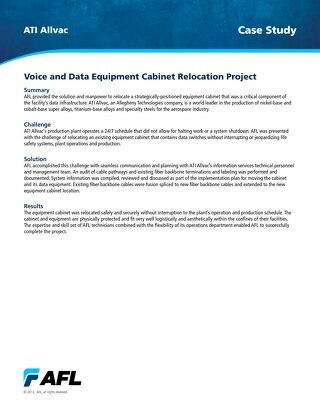 The Department of Immigration and Border Protection opted to install an AFL MTP solution in the Canberra Data Centre to ensure an effective outcome. 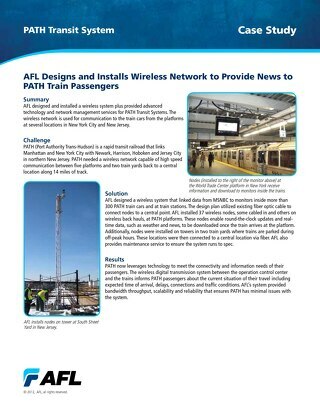 AFL designed and installed a wireless system plus provided advanced technology and network management services for PATH Transit Systems. 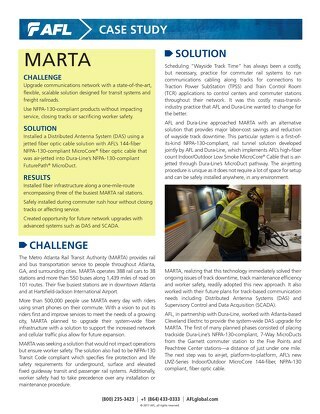 AFL, in partnership with Dura-Line, worked with Atlanta-based Cleveland Electric to provide the system-wide DAS upgrade for MARTA. 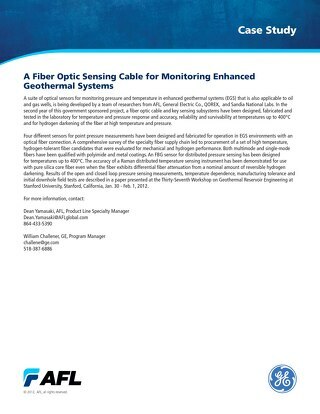 Research update on the suite of optical sensors for monitoring pressure and temperature in enhanced geothermal systems (EGS) that is also applicable to oil and gas wells. 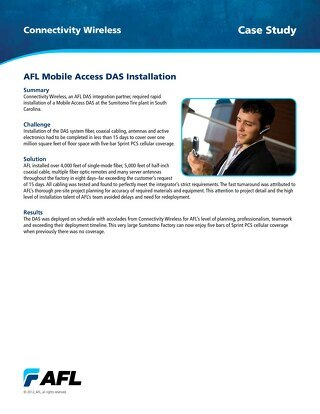 AFL handled the voice over IP (VoIP) conversion for four locations of Wells Fargo Bank's Call Center which included 500 to 1,700 users per location. 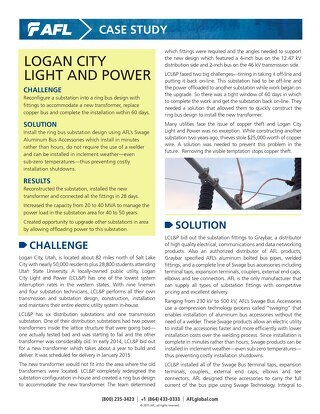 Logan City Light and Power uses AFL's Swage Aluminum Bus Accessories to reconfigure a substation into a ring bus design with fittings to accommodate a new transformer and replace copper bus. 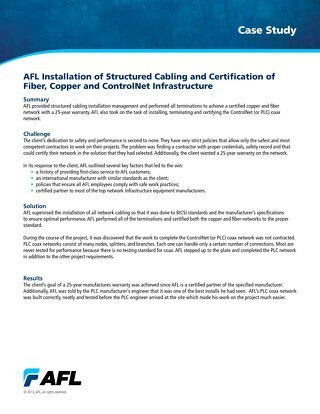 AFL provided structured cabling installation management and performed all terminations to achieve a certified copper and fiber network with a 25-year warranty. 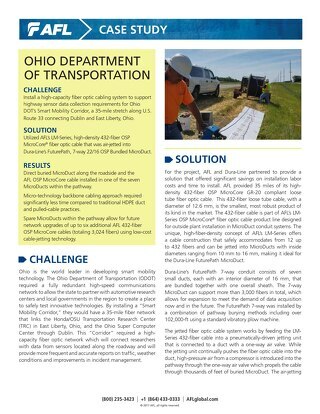 AFL and Dura-Line micro-technology cabling infrastructure provides the Ohio Department of Transportation with an easily upgraded optical platform to support their Smart Mobility project. 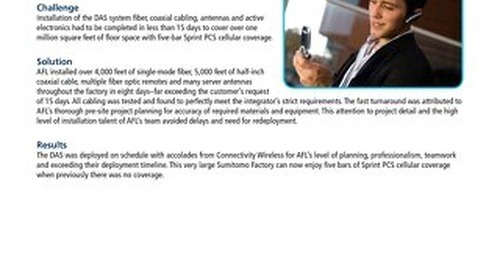 Connectivity Wireless, an AFL DAS integration partner, required rapid installation of a Mobile Access DAS at the Sumitumo Tire plant in South Carolina. 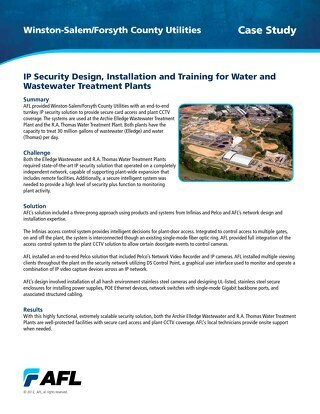 AFL provided Winston-Salem/Forsyth County Utilities with an end-to-end turnkey IP security solution to provide secure card access and plant CCTV coverage. 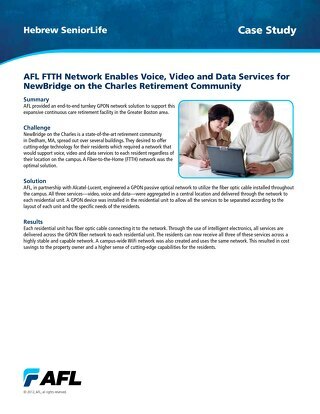 AFL provided an end-to-end turnkey GPON network solution to support this expansive continuous care retirement facility in the Greater Boston area. 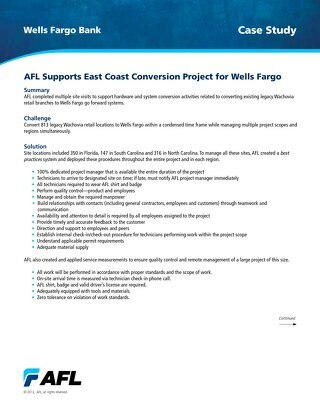 AFL completed multiple site visits to support hardware and system conversion activities related to converting existing legacy Wachovia retail branches to Wells Fargo go forward systems. AFL provided the solution and manpower to relocate a strategically-positioned equipment cabinet that was a critical component of the facility's data infrastructure. 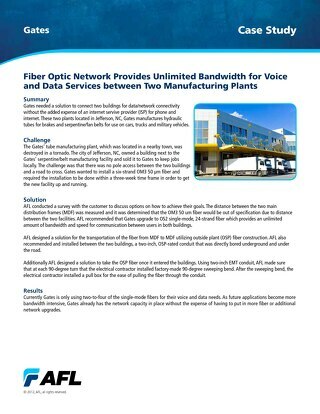 AFL provides fiber optic solution to provide unlimited bandwidth for data and network connectivity between two Gates manufacturing buildings. 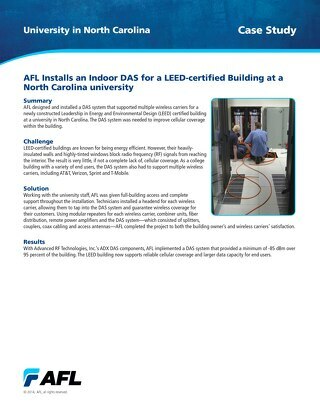 AFL designed and installed a DAS system that supported multiple wireless carriers for a newly constructed LEED certified building at a university in North Carolina.